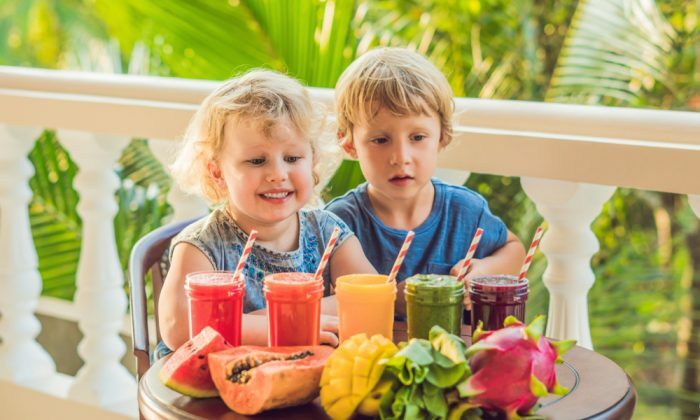 If it's a struggle to get your kids to drink enough water, a fruit smoothie is a great way to keep them hydrated without their even realizing it. Do you drink enough water? Some people forget to drink it, are too busy, or just don’t like the taste. You might want to rethink this if you feel tired, lightheaded and experience headaches throughout the day. You might be dehydrated. Why is dehydration something to avoid? Our body is composed of nearly 70 percent water; it is found in every one of our 100 trillion cells. Water regulates body temperature, lubricates your joints and aids in the digestion process. So, without the essential fluids needed for our body to run smoothly, organs can become damaged and systems don’t function properly. If you have a hard time drinking water and would prefer some healthy alternatives to hydrate your body, here are some options. There is no true substitute for water, but these are a good way to supplement your fluid intake. Have you ever tried a glass of freshly squeezed carrot juice with ginger? Or if that’s not quite your style, try a fresh orange juice. You can get an inexpensive device to squeeze the juice from oranges (or lemons and limes) and then add it to water. Or mix it with your other favorite juices like pineapple or cranberry. There is no end to the combinations you can make and add to your water bottle. Always watch the labels if you’re purchasing bottled juice, and choose the ones “not from concentrate” and without high-fructose corn syrup or artificial colors. Mixing juice with water tones down the sugar content, which is healthier for your blood sugar levels, and will make your juice last longer. Slurp a light vegetable soup as a snack in the mid-morning or afternoon to boost your water intake and energy levels. Use high water content vegetables such as celery, cucumber, iceberg lettuce, tomato, and zucchini. Or blend everything up and take it in a thermos as something tasty and hydrating to sip on all day. Make a smoothie with high water content fruits, including blueberries, oranges, peaches, pineapples, plums, raspberries, cantaloupes, and watermelon. Add water instead of the usual thickeners like dairy, soy, rice, or almond milk. Remember, you want this to be like a fruity jazzed-up glass of water. Make a big batch and let it last for several hours. Coconut water is an excellent way to rehydrate the body, especially after exercise. The coconut contains minerals and vitamins to restore fluid balance, namely electrolytes. You can find coconut water in most grocery stores. Look for the brands that don’t add sugar. Eleanor Healy is a writer with a passion for holistic health and a registered holistic nutritionist. This article was originally published on Naturally Savvy.